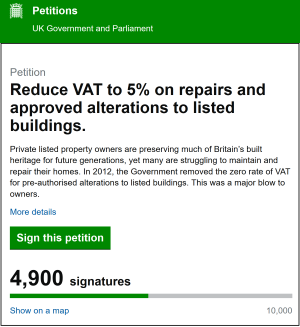 IHBC supports LPOC petition on VAT reductions for LBs: ‘…it is perverse that repairs should be subject to VAT when new development is not’. The Listed Property Owners’ Club is campaigning to persuade the Chancellor to reduce VAT to 5% on repairs and approved alterations to listed buildings in his November Budget. HM Treasury’s decision to remove the zero rate in 2012 was a major blow to the owners of listed homes and since that decision there has been a significant fall in owners seeking listed building consent. This has obviously had an impact on specialist suppliers like yourself who do so much to help owners protect an important part of the UK’s heritage. As part of our on-going Political Campaign for Owners we have launched a national petition to make the case for the reduction and demonstrate the strength of feeling across the country about the damaging effects of the Treasury. If we can reach 10,000 signatures the Government will have to respond; 100,000 and we may secure a debate in Parliament. For more information and to sign the petition visit www.lpoc.co.uk/vatpetition and encourage your customers to do the same. Working together we can make sure our voices are loud and clear.